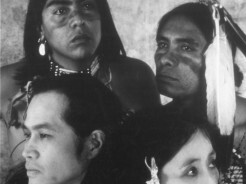 Co-commissioned by the Next Wave Festival, The American Dance Festival, and the Lied Center at the University of Nebraska, Land is a collaboration with Native American musician Robert Mirabal and painter Sandra Lerner. Robert and his cousin and drummer Laynold Lujan live in Taos Pueblo, New Mexico, where Eiko & Koma conceived this work. Not only did Eiko & Koma visit Taos repeatedly but Mirabal also spent three months in Japan and visited the East Coast several times for this collaboration. After a work-in-progress showing at the Hiroshima Contemporary Art Museum, Land toured widely with Robert and Laynold performing live. Eiko & Koma’s six-year old son Yuta performed in the production and his younger brother Shin inherited the role in later tours. 75 minutes. For a CD of music from Land, click here.